Have you ever sat back and realized that, for most of us, coffeeing is a hobby? Don’t we equally enjoy the entire process from grinding to brewing and tasting? Yes, we do – and that’s the only explanation I could come up with for your need to purchase a manual grinder over an electric﻿ burr grinder that’s so much more time and energy-saving. 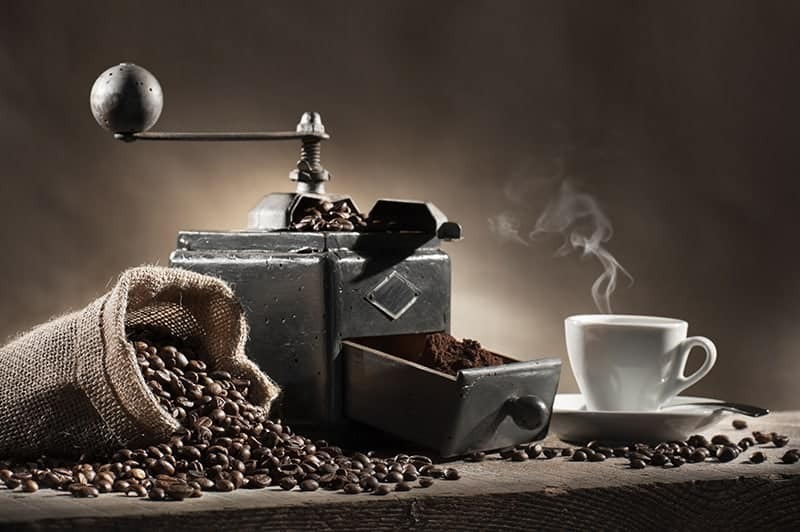 So scroll down to figure out the best manual coffee grinders on the market yet. One of them, for sure, is going to be used in your kitchen. 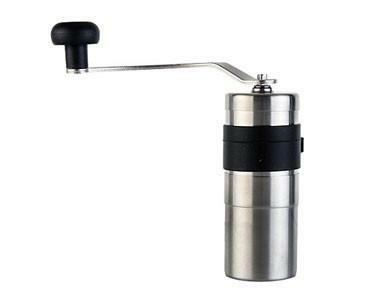 Let's delve into the reviews of manual coffee grinders one by one. 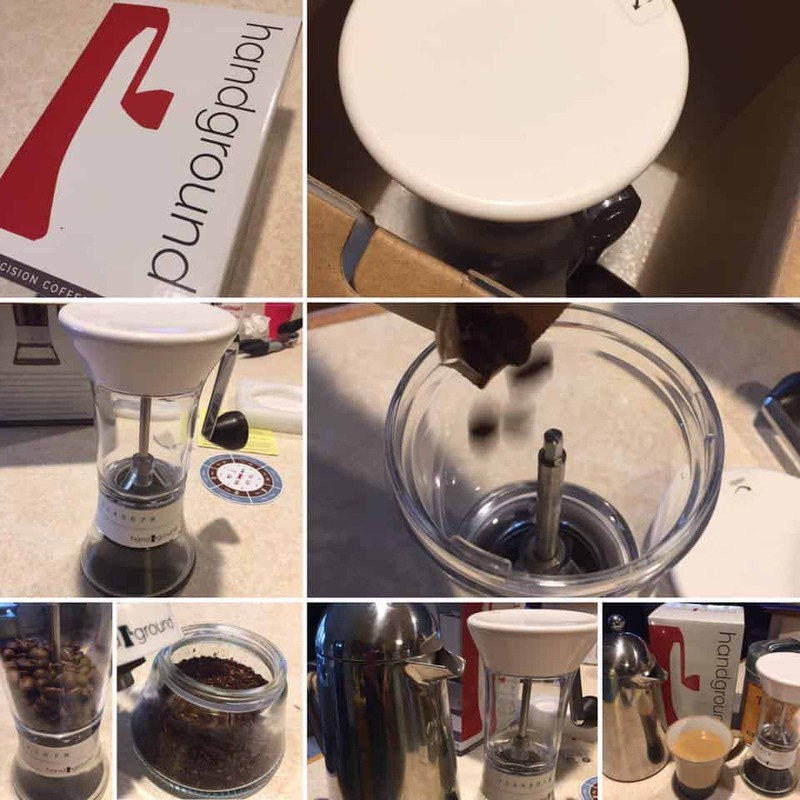 Handground Precision Coffee Grinder is easily the best hand grinder on the market. Everything from its price to functionality and durability has a solid balance – ensuring the best bang for your buck. It may be a beauty to look at, but what actually caught my attention was what lies within – grind consistency. It masters the skill of grinding for 15 different settings including pour over, French Press, A﻿eropress and Espressos. The beans come out so evenly ground that it ultimately ends up making my coffee taste incredibly good. I honestly can’t remember the last time I made such a full-bodied cup at home. Clocking in at 5.8 x 3.1 x 8.7 inches, I do agree that it occupies quite a lot of counter space for a hand grinder. This limits its portability, and may even congest a kitchen. But this issue could be overlooked in the face of the leverage it adds to the overall machine – making the process of grinding easy even for feeble hands. The build quality is also high and robust, so you need not to exert too much pressure to have the beans ground. However, manual grinding also means practicing patience, especially when you’re grinding for espressos. 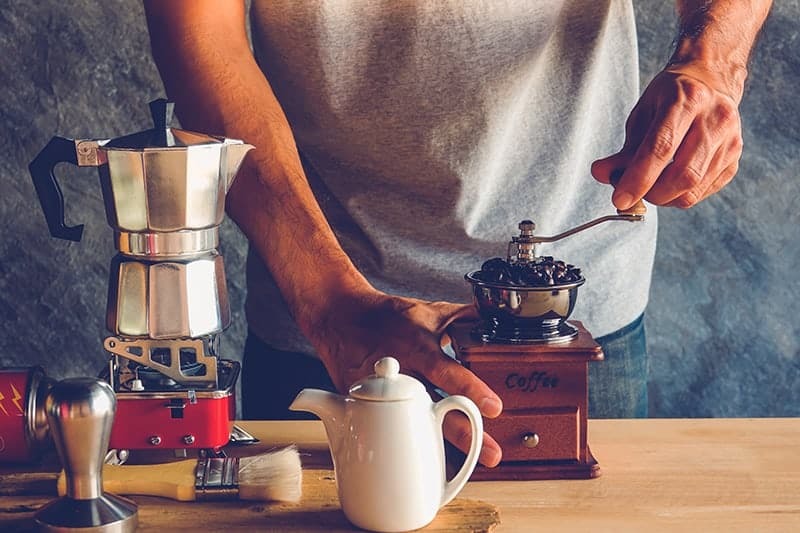 Though a cup of pour-over coffee may not take longer than a minute, grinding for an espresso may take you about 7 minutes to get the perfect texture. But then again, this is an inconvenience common to all manual grinders. 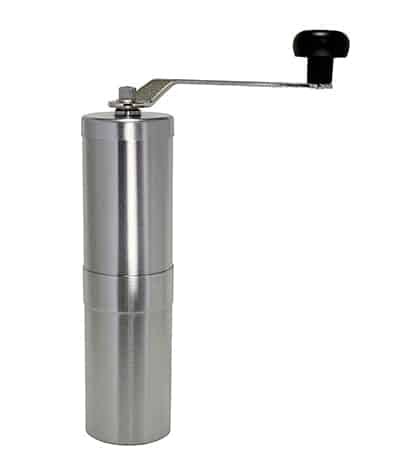 Handground Precision Coffee Grinder is an ideal machine for any coffee enthusiast looking for premium quality grounds. Even the components of the machine boast quality, and manage to put your longevity worries to rest. It indeed is the best hand grinder I’ve come across. Budgeters, Hario Skerton Ceramic Coffee Mill is an answer to your prayers. It is, in fact, a basic unit that does a terrific job at grinding and most importantly, is affordable. What makes it stand out from the rest, however, is its functionality from such a low price point. Out of all the high-rated models in this category, Hario Skerton was the easiest to operate, and took less than a minute of my time to grind for a cup of pour-over coffee. The grounds were far more consistent than what I expected. Let’s be realistic, we can’t expect perfection here. So it was surprising to see how good a job it does at grinding fine enough even for espressos and coarse enough for a French Press. However, the machine has a learning curve because there are no indicators about the coarseness of the grind. So you need to do your homework, turn the screw and keep track of each level to know the exact coarseness setting. Once you get there, the rest is child’s play. The build quality is actually something you won’t be prepared for because it feels solid and robust enough to sustain many years of daily abuse. To be honest, it took me back to the days where our grandparents used to own quality items bought out of pocket money. While the price is the initial siren call of Hario Skerton, it has proven to be a great investment to brew a variety of coffee. However, I wouldn’t recommend it if you’ve a pot of coffee waiting to be brewed. Also remember that it’s labor-intensive, so a few cups of coffee are all what you can expect from this little champ. Here’s a machine that’s been a best-seller on Amazon for a while, and that alone speaks volumes. It doesn’t boast many bells and whistles, but does a flawless job at what it is supposed to be doing. I loved how well it handles any coffee bean I throw at it. The grounds come out good enough to brew me a decently flavored coffee. Grind consistency is maintained for everything from French Press to pour-over and Aeropress as well, especially compared to that of similar models. Better still, it is slender and tall, hardly occupying any counter space. It’s also the go-to coffee grinder for campers, hikers and fishermen. In fact, you no longer have to sacrifice your cup of freshly ground coffee just because you decided to spend time outdoors. It’s just the perfect size to go right into your travelling bag! Another point worth noting is the customer service of JavaPresse as it definitely deserves a thumbs-up. They actually go above and beyond to ensure customer satisfaction, and dissatisfied customers are not left unheard. They even wanted my personal opinions of the machine to see whether there’s any room for improvement. There weren’t any gripes I could find, except for a slight learning curve. This is because the coarseness of the grind cannot be determined unless you figure it out yourself by referring to the manual. However the clicks on the cranks are pretty straightforward to figure out. 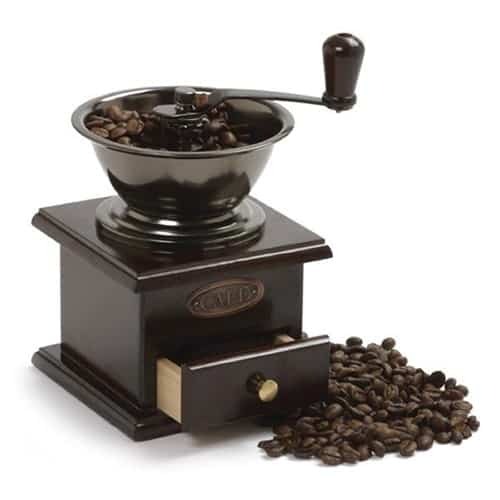 Compact and affordable, JavaPresse is a game changer for a grinder in this price range. In a nutshell it’s durable, efficient and well-worth the money. The grind is consistent enough to preserve the flavors’ of coffee, and fast enough to have your coffee ground even before the water starts boiling. 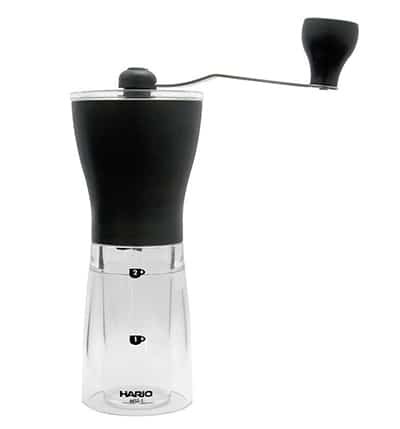 Then Hario Mini Mill Slim Hand Coffee Grinder will give you a head start. Designed to fit into most places a coffee grinder wouldn’t dare to, this mini grinder can handle up to two cups of beans at a time and does a fine job at it. Like most manual grinders in this price range, this one too, has a learning curve on the fineness settings. You need to get the hands-on experience to discover how coarse or fine the grounds would be. Once discovered, grinding can be done even with your eyes closed. There’s no setting that the Hario Mini fails to grind. While it’s true that the finest setting isn’t the easiest to achieve, my observations showed that the grind consistency is maintained well. 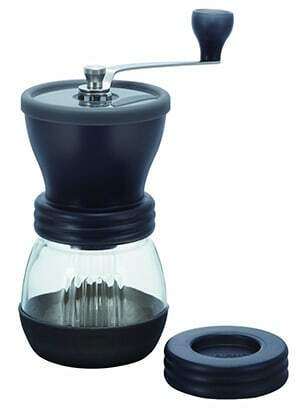 In fact, this is a grinder that’ll help you savor whatever the coffee you prefer to brew. Another thing worth noting about the machine is its convenience. It’s so light, easy to handle, and once the bottom is unscrewed, the coffee can directly be dispensed into an aeropress and into whatever the machine you choose to. This makes cleaning a whole lot easier. If longevity concerns you, then let me give you a fair warning that this is a machine that might outlive you. Even the ceramic burrs will not wear down, so you’ll not have a reason to replace it even after a daily abuse for a good couple of years. The Hario Mini isn’t a high-end model, but surprisingly has the grind consistency of one. Though time consuming like all hand grinders, it’s pretty straightforward to operate, and its longevity beats every other grinder on the market. 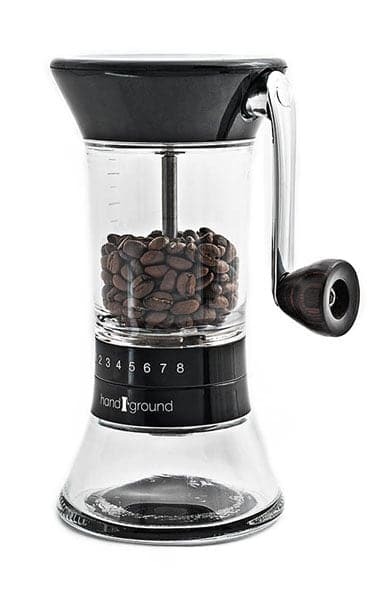 If you love grinding coffee as you drink, then this is a unit worth investing in. Looking for a grinder for daily use? Then look elsewhere, Norpro ain’t the one for you. This is because Norpro is made to sustain mild use, but when used occasionally, it’ll make your coffee taste as good as it can ever be. To start off with, it’s one of the cutest grinders I’ve laid eyes on. The vintage design would be a great addition to any modern kitchen. For the size and price, one wouldn’t believe that it could actually grind. But grind it does, for any type of coffee from French Press to pour-over and more. The grind consistency is amazing, whether it be coarse or fine. However, on the downside, beans sometimes escape the hopper whem grinding. This could be quite annoying to clean but given the price, I’d say that it’s a minor inconvenience. On top of that, however, the grind collection drawer is pretty small. You’ll have to nearly empty it twice if you’re grinding for a pot. But then again, that’s one of the things that makes Norpro compact and portable. Like most low-cost hand grinders, this one too, has a learning curve when it comes to the grind coarseness. The settings are not marked, nor are they illustrated. You’ll have to figure them out on your own, and for me, it took only two tries. If you’re newbie to the art of make-at-home coffee, then Norpro is an affordable, entry-level unit that’ll help you get started. It’ll teach you just how good coffee can get, and help you decide whether you really want to go ahead. You can also use it as an antique decorative in your kitchen, for it’s both functional and cute. It’s time to wave off foul-tasting camp coffee and carry this Cozyna with you. Lightweight, slender, and affordable – it’s just about perfect to go backpacking. Being compact hasn’t limited the functionality of this grinder to one person, as it can hold up to 30 grams of coffee beans – enabling you to brew coffee to your entire camping crew. Better still, it comes with a window that lets you sneak a peek at how much you’ve ground. This way, dismantling the unit time to time becomes unnecessary. Though figuring out the perfect grind setting may take a while to learn through trial and error, the grind consistency is praise-worthy. 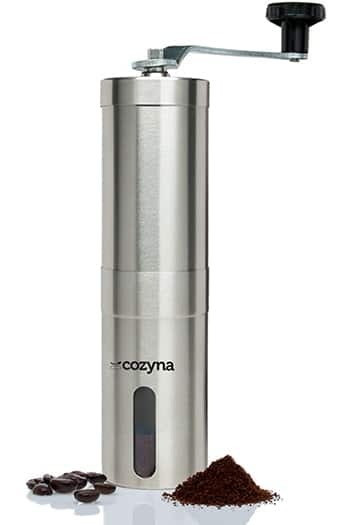 Cozyna, in fact, can grind to match any coarseness setting you want. The finest setting however, requires effort and you might as well replace this excursion with your routine exercise. In the meantime, I did notice that the coarsest grounds produced by the machine weren’t ideal as they included powdery grounds as well. While this may not significantly affect coffee quality, I’d advice French Press coffee lovers to think twice before making a buy. If travelling is your thing, then recommending Cozyna for your expeditions comes without hesitations. It’s compact yet spacious and slender enough to fit right into a backpack. What’s more, it does quite well in the longevity department as well, and will certainly live up to your money’s worth. 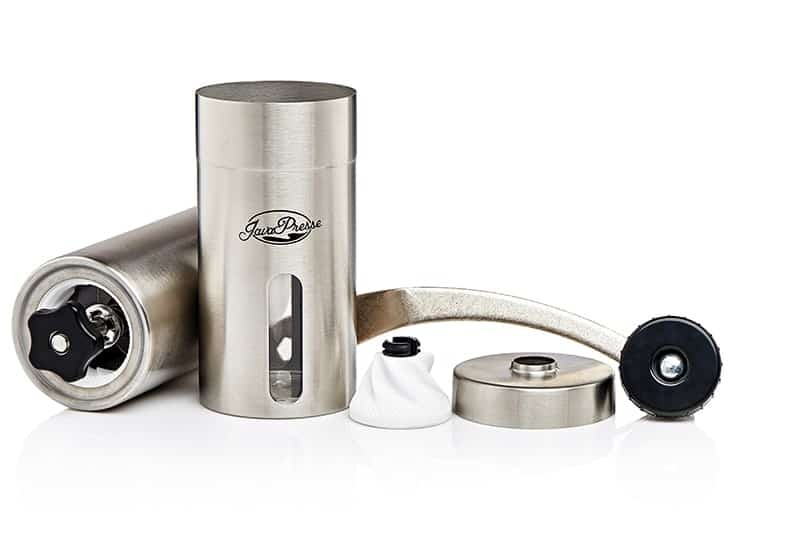 Housed with stainless-steel, Porlex Mini is the epitome of a high quality grinder. It consists of ceramic, conical burrs that are very efficient. Only a few plastic caps could be found on the entire machine, so not only is the look, but also the feel of it will put your longevity worries to rest – especially if you’re a reckless camper. Though durability is what sets it apart from the rest, it’s highly functional too. It, in fact, excels at most grind setting from fine to coarse and everything in between. Whether you prefer French Press, Aeropress or pour-over coffee, rest assured that you’ll get the great consistency and texture you need. However, finer grounds require more manual labour and if you ain’t young like me, you won’t be able to make it past one cup of coffee at a time. But I loved how easy it was to crank, which wasn’t the case in cheaper units. In the meantime, you need to keep on mind that Porlex Mini is just like what the name suggests. In fact, it’s a mini grinder that can’t accommodate more than 20 grams at a time. So if your partner is a coffeeholic too, then you’d better opt for the more spacious version of the Mini. Out of all portable hand grinders, Porlex Mini is the most durable. The stainless steel ensures it stays put even if you give it the least care when you go backpacking and the conical burrs make manual grinding as good as it can ever be. If you’re a loner, I simply can’t recommend you a better unit than this. When I hear the brand Porlex, quality is the first thing that crosses my mind. It actually is a Japanese brand, known to produce equipment that are nearly as good in quality as the ones being passed to you by your grandparents. Porlex JP-30, however, is the brother version of Porlex Mini. They both are exactly the same, except for the fact that the former features slightly larger bean and ground holding chambers. So if you’re like me, who tags your spouse or a couple of friends along whenever you go backpacking, then Porlex JP-30 should be what you’re after. Just like the Mini version, the JP-30 is housed with stainless steel with built-in ceramic burrs. Ceramic burrs have the longest lifespan of all because they never really wear out. So time and again, you receive the assurance on the longevity of the machine. Cranking mechanism is one of the easiest to use so you can effortlessly switch between grind settings. There are about 12 grind settings in total and that includes everything from Turkish to French Press and fine espresso. If you’re wondering about grind consistency, let me tell you that it’s the best in this category. Let it be fine or coarse, you should absolutely not worry the least. And all in all, I could hardly come up with any gripe related to the machine. The initial price of this little grinder might strike you as high, but given the overall quality and grind consistency, it’s pretty reasonable. Porlex JP-30 is also one of the best portable grinders out there, that wouldn’t worry you once you hit the road. I hold nothing back in recommending it to anyone looking for an on-the-go grinder. I always feel extra good when I do something in style. That was the main reason why I gave Foruchoice the time of day and I couldn’t be happier. It might look like it was pulled right out of a 20’s cabinet, but competes head to head with today’s hand grinders. It can grind about almost anything, with multiple grind settings from French Press to Turkish and espresso coffees. Though the grounds aren’t as consistent as I want them to be, it didn’t make my coffee taste foul - and for that, I was grateful. But then again, I wanted to use it more like a decorative ornament than a grinder. So when it isn’t grinding coffee, I have it decorating my kitchen. Better still, it looks nothing like the price you pay for it. From an arm’s length distance, it’ll fool anyone into thinking that it indeed is a high-end antique. Moreover, I enjoyed a great deal emptying the grind collection chamber. It’s the cutest of all, as it’s designed to look like a tiny little cabinet drawer. But on the downside, it’s extremely small and could barely hold one-cup of grounds. If you’re more concerned about the looks than functionality of a manual coffee grinder, then Foruchoice would be an ideal choice. That, however, doesn’t mean that it can’t grind you a good cup of coffee. It’s, in fact, pretty durable and easy to use. I actually can guarantee that you’d fall in love with it on first sight. A manual grinder can be better defined as a unit with a lower price, spinning at a slower pace. But they’re often preferred to electric grinders for many reasons, and the most important of them all is the taste. Manual grinders are believed to retain more flavors of coffee because the grinding process produce only a little bit of heat. They’re also less noisy and more durable. However, shopping for the ideal grinder may exhaust you – specially with so many options to choose from wherever you look. That’s why I’ve put together a basic buying guide and I’m pretty sure it’ll gear up your search. If you’re looking for a grinder that’ll cater the coffee demand of your entire family, then a manual grinder is so not the one. They take more than a minute to grind just a single cup. So you might feel as if a lifetime has passed by the time it readies coffee for your family. Also, they’re not the most fun to operate. If you own a pair of aging hands, then grinding more beans will only make you feel old. So make your expectations realistic before you go in search of a manual grinder. Buy one only if you’re planning to grind for a maximum of 3 to 4 people. If you’re like me, who goes from pour-over to espresso and French Press coffee within the course of a day, then you can’t ignore the variety of fineness settings available in your grinder. Most hand grinders have more than 10 settings, and they do a job well done at each setting. So focus on what they are, and how easily they could be cranked to achieve the desired setting. Grind consistency, no questions asked, is one of the secrets behind a delicious cup of Joe. While the consistency of a manual grinder may not be as good as that of an electric grinder, some units produced great results in our testings. So go through our list to find out what those units are. 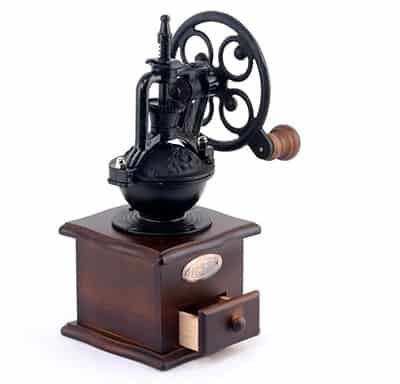 Since hand coffee grinders are the direct victims of your excursions, they need to be robust and strong. So always opt for a model with a stainless steel body, and a stern handle. As a matter of fact, you can’t avoid plastic – they’ll at least be presented to you as a nut or bolt. However, some brands such as Porlex make grinders that will last long even with plastic parts. Look for a grinder that’s not only easy to use, but also clean. Such grinders should have robust components that come apart easily for cleaning. Most units need to be hand washed, and you need to take extra care washing crevices and the blades. But there are units that can be machine-washed as well. Love outdoors but can’t bear the thought of skipping your cup of freshly brewed coffee? 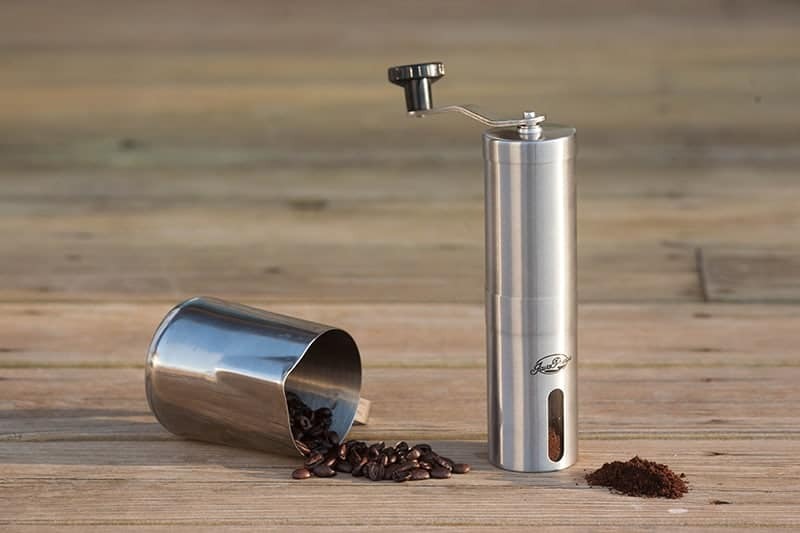 Then get yourself a portable coffee grinder - and yes, they exist. Even better, newer models compromise nearly nothing for portability, and some even have enough room to accommodate coffee for more than one person. Manual grinders are cheap – both to buy and operate. This is because they’re traditional, and require only man power to operate. Some units are dirt cheap, and can even be bought for less than 20 bucks. While they might not rock the longevity department, they still manage to perform well. For your information, our shortlist will give you a good start. I’ve just poured over – not coffee, but everything that’s needed to make good coffee grounds at home, in one single article. Some units included here were subjected to extensive research, while some were tested by my own. Finally, I’d put two and two together to craft this article and now it’s in your hand to match the grinder with your needs and make the ideal buy. Bought the Hario Skerton. After a few MINUTES of grinding, my hands cramped up in PAIN. WAS NOT YET ENOUGH FOR a full pot (5 cups) of morning coffee. Returned it as soon as I was able to use my hands again. Have purchased an electric Encore , ceramic burrs.